As the Chinese New Year draws to a close—the Year of the Dog—I’m reminded how enduring Bountiful’s Mandarin restaurant is. The annual Chinese New Year has been being celebrated there since it began on February 16th and the festivities come to an end this weekend. 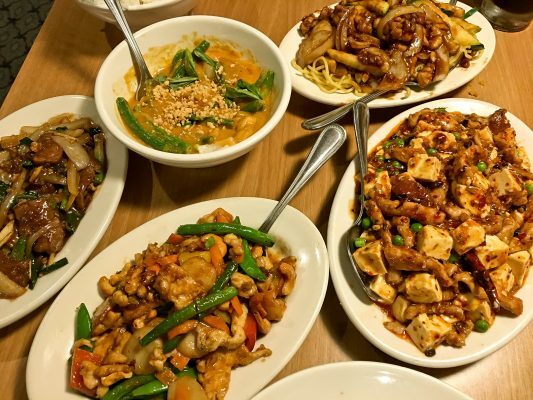 It’s always a fun, colorful time to dine at Utah’s venerable Chinese eatery, which is doing some celebrating of its own. Mandarin turned 40 this year—what an accomplishment! In case you don’t know the story, the Mandarin opened in January of 1978 when Gregory Skedros—then the owner of Mountain View Pharmacy in Bountiful—launched the restaurant with his wife Jeni and family. I can’t imagine that he’d expected to be in business four decades later. The restaurant is still a family affair and Mr. Skedros, now 90 years old, continues to be involved in the restaurant, arriving early every morning. 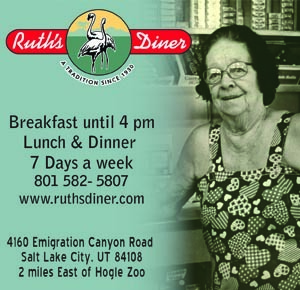 The eatery recently underwent a facelift, and the Davis County dining destination looks as inviting as ever. 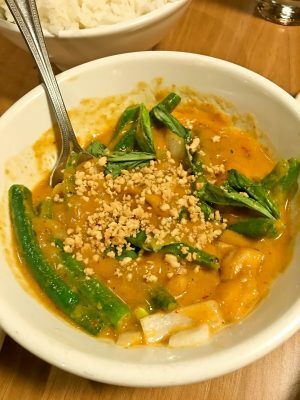 Although the business is Greek-American owned, the Mandarin kitchen is staffed with Chinese chefs from China and San Francisco, many of whom have worked at the restaurant for longer than most restaurants stay in business. That’s our good fortune, since thanks to the talented and loyal Mandarin cooks, we can enjoy authentic Chinese cuisine the likes of which you probably wouldn’t expect to find in Bountiful. By late afternoon, especially on weekends, lines for tables at the Mandarin have already begun to form outside. The restaurant opens at 5:00 Monday through Thursday, and at 4:30 Fridays and Saturdays. By the times the doors open the foyer and waiting area are mobbed and stay that way until after 7:00 PM, when the early-eating crowds begin to die down a bit. A word of advice: since the Mandarin only takes reservations for groups of eight or more, get there late so as not to have too long a wait. Once seated, an order of char shu is a must. My wife’s family has been enjoying the Mandarin’s char she for about as long as she can remember. 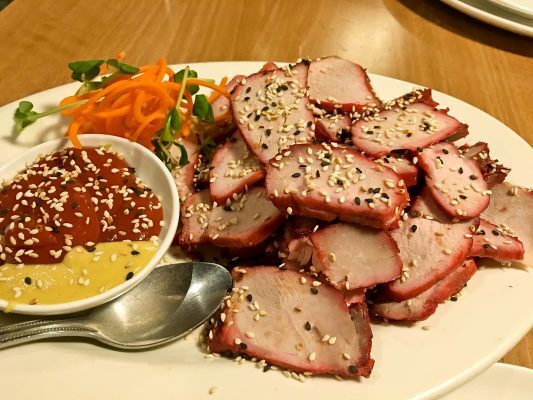 I’m a latecomer, but have also come to love the appetizer—a dish generously piled high with slow-cooked Chinese barbecued pork topped with sesame seeds and served with a sweet red sauce and fiery hot Chinese mustard. Angel—Greg Skedros’ daughter—recommended an extra little dish of sesame seeds for dipping, since that’s the way her dad likes it. Another outstanding appetizer—and everything at the Mandarin is portioned with sharing in mind—is the chicken Soong Imperial lettuce wraps. 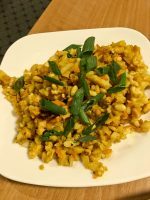 It’s a delicious mixture of chicken diced with water chestnuts, carrots and pine nuts, served with hoisin sauce and fresh romaine lettuce for wrapping. I love the crunchy texture as well as the complex flavor. With some 100 menu items, deciding on which ones to forego is a feat, as well as an excuse to return to try more of them another time. During our Chinese New Year visit my family loved the spicy Szechwan Pork and Tofu ($12.49), to which we added the recommended Chinese sausage ($1.49). 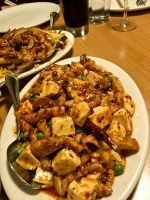 I’m glad we added the sausage, which added an interesting flavor dimension to the ground pork and stir-fried tofu dish. Through the years, I’ve been very impressed by the quality of service at the Mandarin, and this visit was no exception. Our manager/server, Garrett, was quite conversant and knowledgeable about not just the extensive menu, but also cocktails, wine and such. The Mandarin has a terrific drink list and a decent wine selection, not to mention lower wine markups than most upscale restaurants. To wit, a bottle of Caymus Conundrum which retails here in the Beehive for $26 is priced at a mere $32 on the Mandarin wine list – very fair. Completely satiated by our Mandarin meal, we somehow allowed ourselves to be talked into dessert. 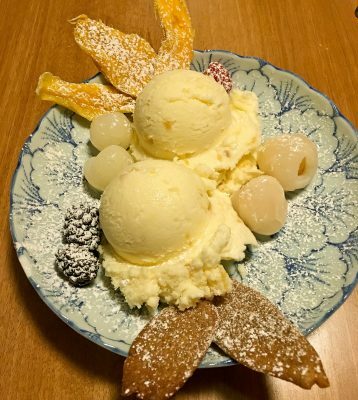 I’m glad we did, because the ginger ice cream with lychees, longan, and five-spice cookie crisps was simply stupendous. No … seriously … it was that good. 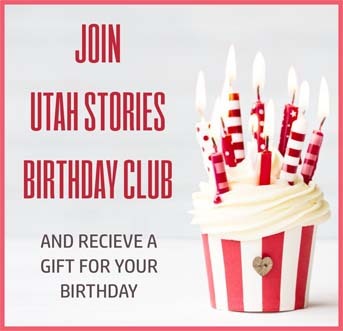 Here’s looking forward to another 40 years of the Mandarin—an original, independent Utah institution. Got a favorite Chinese restaurant? We’d love to hear about it!